Mount Batur, or Gunung Batur, in the Kintamani region of East Bali is an iconic, extremely-active volcano that draws tourists in with both beauty and promise of adventure. Rising to 5,633 feet, Mount Batur can be summited by physically-fit hikers in around two hours. 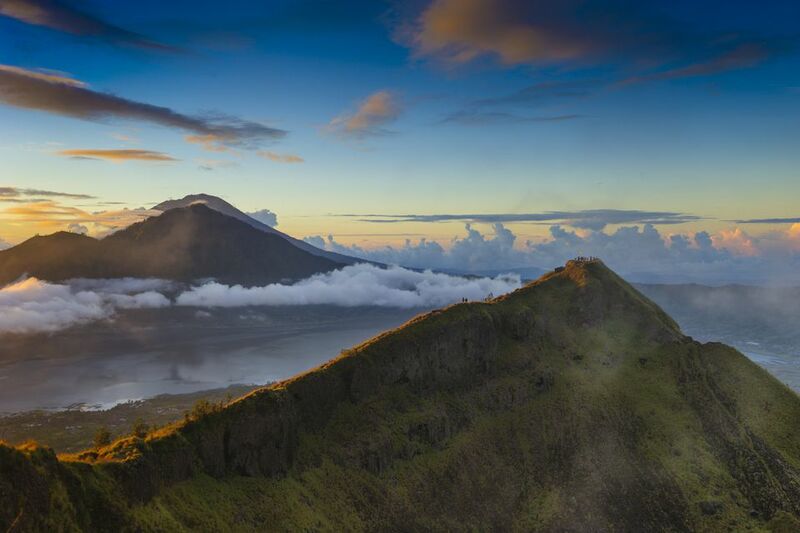 Climbing Mount Batur offers a rare opportunity to enjoy an unforgettable sunrise from the top of an active volcano. The views of Bali from the top are stunning. Part of Mount Batur's massive caldera is filled by Danau Batur, Bali's largest crater lake. A smaller stratovolcano juts out of the water 2,300 feet and frequently reminds the local villages that they are situated on top of a geological time bomb. Excellent views of Mount Batur can be photographed from the nearby village of Penelokan in Kintamani. Other small villages and settlements established around the rim of Mount Batur offer great vantage points and opportunities to explore the surrounding area. A horde of pushy guides and travel agencies - all operating under the same organization - offer early pickup in Ubud (around 2 a.m.) and guided treks to the summit of Mount Batur. Tours usually include transportation, a simple breakfast, and a guided walk up the volcano to watch the sunrise. Although typically small, tour groups tend to stack up on the trail during the busy season. Pricier tours sometimes include a buffet-style lunch. If making your own way to Kintamani, book a guide at the Association of Mount Batur Trekking Guides office located in Toya Bungkah. Chances are they will approach you with offers as soon as you enter the village. Guides are regulated by a local monopoly and are flat-priced. Assuming a good performance was given, groups typically tip their guides at the end of the trek. Climbing Mount Batur without an organized tour is very possible if you can endure constant harassment and bullying from local guides. Touts in Toya Bungkah are relentless about discouraging independent trekkers and will even mislead groups by giving wrong directions to the summit. For safety, always team up with other travelers and enjoy the trek as a group. Most people begin the climb up Mount Batur from the village of Toya Bungkah. Fit trekkers should plan a minimum of two hours to reach the summit, although inadvertently taking the wrong path can increase the time required. Alternatively, those looking for a more challenging experience away from the masses can begin the trek from Pura Jati. Unlike the pleasant trail from Toya Bungkah, this route involves scrambling across a jagged lava field to the summit. Proper shoes are a necessity to protect feet from the sharp rocks. Mount Batur is one of Indonesia's most active volcanoes; the summit was closed to tourists as recently as November 2010. In 2009, a group of backpackers was surprised by a new eruption while trekking to the summit without a guide. Before planning a trek, ask around about the current temperament of the volcano. If there is any chance of activity, postpone your trek and just enjoy the fireworks from the rim. Unexpected showers frequently pop up in Kintamani, making the paths up Mount Batur slippery and potentially dangerous. Trekkers should wear proper shoes as the shale becomes loose. The sharp volcanic rocks will make short work of sandals - and feet - if you hike without proper protection. While certainly not as cold as Mount Rinjani, cool temperatures and strong winds will make teeth rattle as you wait for sunrise at the summit. Entrepreneurs offer to rent wind jackets, not a bad idea if you did not pack your own. Once up, the sun quickly bakes the rocks to cooking temperatures. Mount Batur offers very little shade at all; wear a hat and take sunscreen. Mount Batur is located in the Kintamani region of northeast Bali, Indonesia. Several north-south roads run between Ubud in Central Bali and Penelokan - the gateway village for exploring Kintamani. Most people book a bus from Ubud to Kintamani. The roads are fairly well maintained; the journey takes around an hour. Inquire inside one of the numerous travel agencies dotted around Ubud or ask at your reception the day before you intend to visit Kintamani. Transportation is also available from the Batubulan minibus terminal in Denpasar, however, the local bemos (minivans) make dozens of stops along the way. Minibusses to Kintamani are available from Kuta in South Bali; the trip takes around two hours depending on the route. Nothing beats buzzing past the unbeatable scenery in Bali at your own pace. Scooters can be rented in Ubud - the perfect solution for exploring the small, spread-out villages in Kintamani. Once past Ubud's congested traffic, the roads stretching north are in good condition. Parallel roads mean that you can make a loop of the 20-mile journey between Ubud and Penelokan. Although most locals tend to ignore the law, remember that you are required to wear a helmet while on a motorbike. Kintamani receives a fair amount of rain even during the dry season - be prepared.